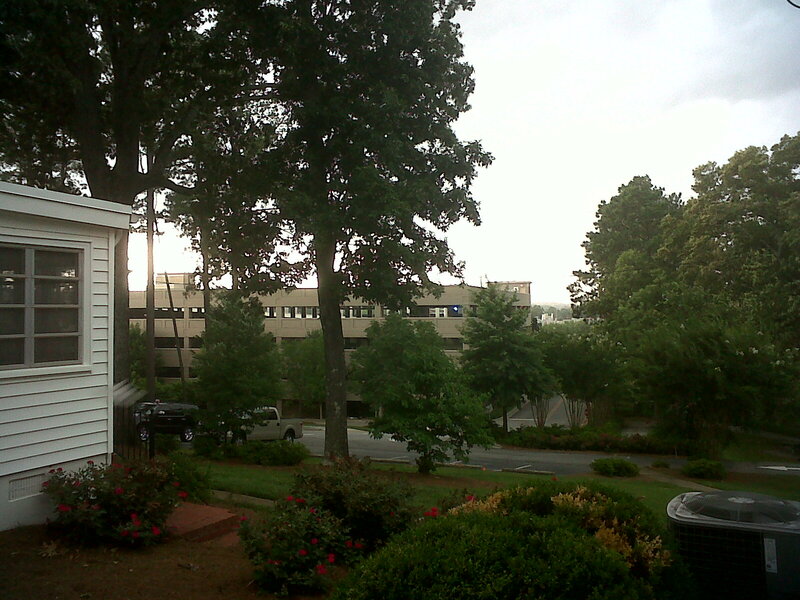 A storm brews in Carrollton, Ga.
Looks like we’re in for some nice, strong storms again tonight. I enjoy storms. I love watching the lightning flash, feeling the thunder rumble through my bones. I like seeing the rain come down in sheets. Perhaps it stems from being a farmer’s grandson. Rain was manna. It was the promise of a fruitful harvest. And it was not to be wasted. The house was circled by plastic five-gallon buckets that caught the rain that poured from the roof and stored it for the dry days. Rain made the tomatoes plump, the zucchini swell, the pole beans pop on the vine. Alas, others in my home do not share my joy for storms. My wife is the problem. If we had a dog, I would not be surprised to find them both cowering beneath the bed as a storm blows in. We spent the better part of the first spring in our house hiding out in the basement. She still has me keep the space beneath the basement stairs free from cobwebs in case she needs a clear place to wait until the storms pass. As of late, however, these summer storms have really started to piss me off. The last series of strong storms knocked out our electricity for something around 14 hours. Beyond having to dress for work by an oil lamp, we also had to concern ourselves with spoilage of our groceries in the fridge. Now, rather than greeting the rain with welcoming arms, I stand around, nervously tapping my foot, hoping the lights stay on. To be sure, these 14 hours was the longest span of time we’d been without power, and Georgia Power has been prompt in restoring electricity to our home. But now that I’ve begun following Georgia Power on Twitter and seeing their reports of outages and the time they expect it to take to restore service to various parts of the state — 2,500 our here, 900 out there, tomorrow night or the night after when service will be restored — I’m becoming anxious. I know our days without power are coming. Everything’s eventual. It’s just… when? Should it come in winter, we’ll be OK. We’ve a gas fireplace, a burner on a gas grill to cook food, plenty of blankets, etc. In summer… Well, we’re just going to be hot and smelly. I read a book once because the title struck me. It was called “Praying for Sheetrock.” It was set in McIntosh County, along the Georgia coast, and was about the rise and fall of the county’s first black politician. In it, it told the story of an old, black woman who lived in a dilapidated shack alongside the highway. Her family had built her a pretty new house behind her cinder block shanty, but they ran out of funds before they finished the house. With no sheetrock, they could not get a certificate of occupancy so the woman could move in. When trucks wrecked on the highway, the sheriff would often look the other way while the impoverished locals made off with the rig’s shipment. So it was that people would pray for certain loads to wash up along the highway — shoes, food, etc. For this woman, she prayed for sheetrock.